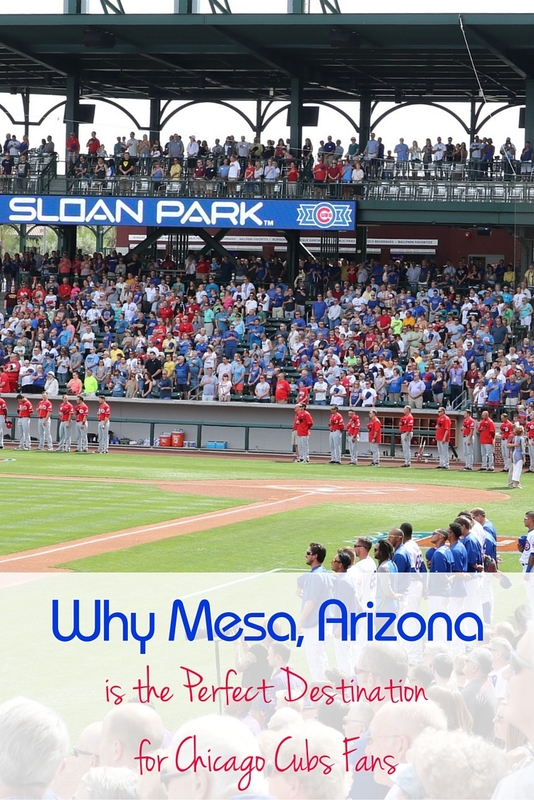 Mesa, Arizona is the 38th largest city in the United States, and the baseball spring training home for the Chicago Cubs. The population fluctuates in spring, as Midwesterners descend on the city. Chicago Cubs fans come in droves to support their favorite team. 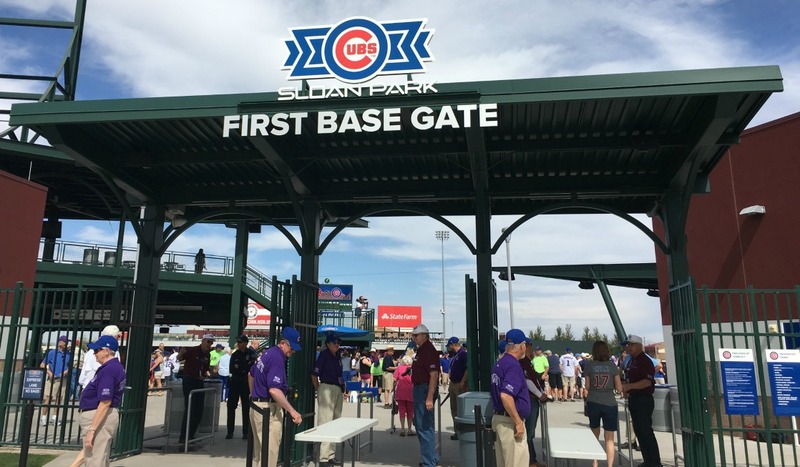 In 2014, Mesa and the Cubs opened Sloan Park and Wrigleyville West. This dynamic development pays homage to Wrigley Field in Chicago, and to the fans who love it as well. Not only are the Chicago Cubs a part of Chicago history, they are woven into the thread of Mesa’s story as well. Since 1952 the team has played every spring in the Cactus League. Visitors will be thrilled to see the similarities between the two parks and Chicago influences in the ballpark cuisine. Outside of the park there are plenty of entertainment, adventure, and learning opportunities for families. All of these make Mesa, Arizona a perfect destination for Chicago Cubs fans. Sloan Park can hold over 15,000 fans, and walking around the stadium feels like a day at Wrigley. The back stop is made of brick to replicate the back stop at Wrigley. The outfield grass area is cleverly shaped as a nod to the Wrigley bleachers. The team regularly sells out the ballpark, and last season set the all-time major league Spring Training record for home attendance. As the new World Series Champs, this year will be one for the books. Chicago Cubs fans love their team! Chicago food fans will have the option of eating Portillo’s Italian Beef, Chicago style hot dogs, Italian ice, and even Giordano’s pizza. There’s also a Dos Gringos Mexican bar area, food truck area, and a Kettle Corn stand (although I would love to see a Garrett’s Popcorn). Traditional ball park fare is also available. The players are usually willing to sign autographs before the game. There is an area between the complex and the Under Armour Performance Center where players walk back and forth. This might be a good place to get a signature, but inside near the left field wall is a good spot too. After players were done warming up, several might make time to come sign autographs. It’s something that doesn’t usually happen at the larger stadiums. Just inside the first base gate is a replica of the Wrigley sign. Here visitors can have their name in lights on the marquee. Kids would love this. There’s also a “kids club” area which is just a small play space where kids can practice pitching at a target or hitting wiffle balls. The outfield area is perfect for families with plenty of space to spread out and let kids wander. Just outside the park is Riverview Park. It has the world’s tallest rope climbing tower that stretches 50 feet into the air. There’s also a 75-foot zip line, splash pad, and amazing playground. This is within easy walking distance to the field. It is such a spectacular looking park, kids might never want to leave. The area just outside the ballpark is known as Wrigleyville West. There is also Riverview shopping center across Dobson Road with fast food and chain restaurants, so plenty of choices for families. One of the standouts is Brass Tap, where families can find pizza and burgers, and parents can enjoy adult beverages. If you didn’t get your fill of Chicago food inside the ball park, there’s a Portillo’s a couple of miles away in neighboring Tempe. There’s also a restaurant called Postino on the ASU campus that has a mouth watering Mediterranean menu to enjoy. If the kids are hungry before the game head to Snooze, a Denver based chain that does an amazing breakfast service. Don’t be put off by the crowds, they are there for good reason. 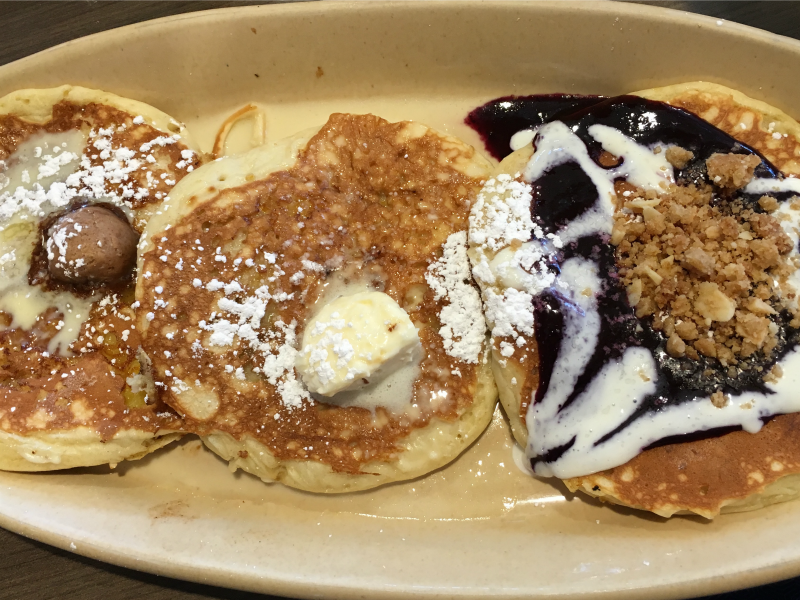 Wait for the pancake flight, it’s worth it. I dare you not to try the pancakes! Immediately next to the ballpark is Sheraton at Wrigleyville West, providing easy access to the stadium. For families wanting a marvelous pool, head to Hyatt Regency Scottsdale Resort & Spa at Gainey Ranch or the Westin Kierland Resort & Spa. 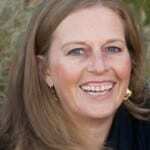 Both will not disappoint, and easy highway access makes getting to and from Mesa easy. 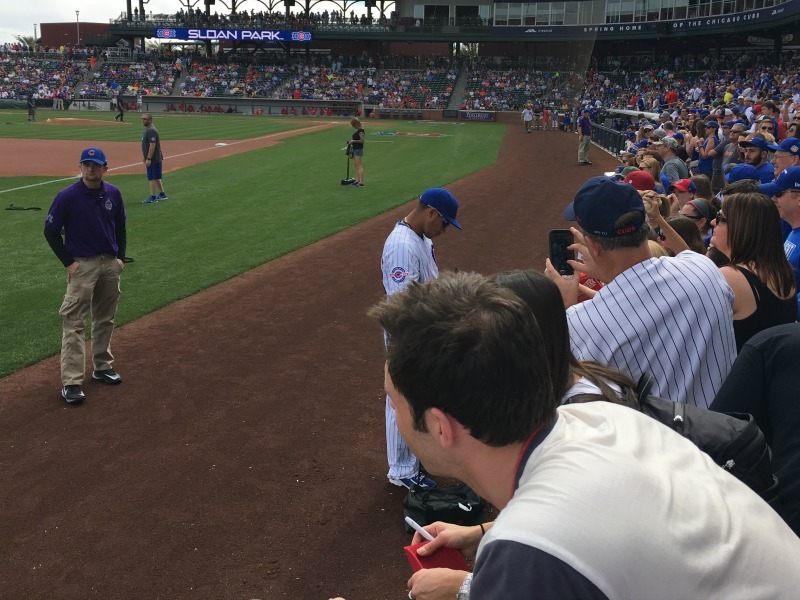 Whether you come for the baseball or something else, it’s obvious Mesa, Arizona is the perfect destination for Chicago Cubs fans. Here they can find the food they know and love, the iconic ballpark features of Wrigley, and plenty of sunshine. As crazy as it sounds, Mesa is a little slice of Chicago in the Arizona desert. Looking for relaxation in Arizona? Check out these fabulous spa retreats you can visit away from the park. Next Post: Free Family-friendly Fun in Branson, Missouri!